It's offish that time of year folks, there's no getting away from it, best to just embrace the feelings of festiveness and hunker down with some of your favourite Christmas movies. It's cold outside, the snow is beginning to fall and it's time to light some festive scents, grab some mince pies and get down with Christmas. There are many reasons why I love Christmas movies, there's always a black sheep character, someone has taken a wrong turn in life or on the road and the movie is about the journey back to finding your Christmas. That one point in every Christmas movie that makes your heart and emotions swell, your eyes fill with tears, you feel the emotion and the heartfelt joy of Christmas. They really are some of my all time favourite movies to watch. 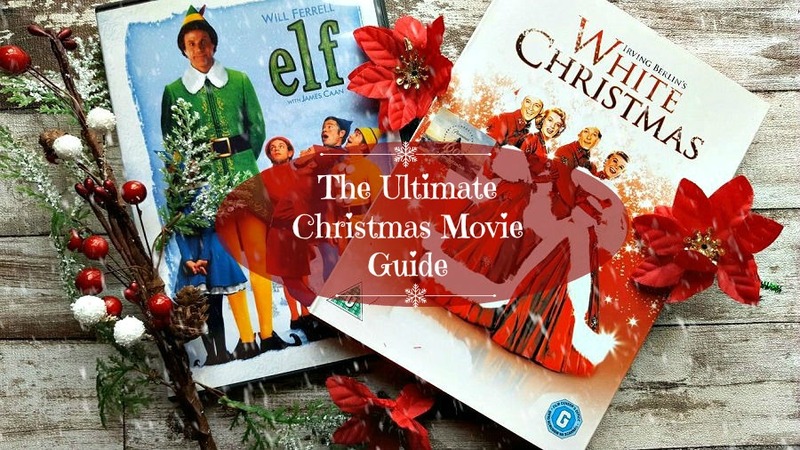 In case any of you adore Christmas movies as much as I do and see them as an integral part of the lead up to the festive season, here is The Ultimate Christmas Movie Guide. All my favourites, all for differing reasons, no one better than the other, they all offer something a little different. Let's start as we mean to go on. Now, remember I'm not listing these in any order because it'd be impossible to figure out top favourites - it's already taken me long enough going through my stash! White Christmas - sometimes confused with Holiday Inn. Personally I prefer White Christmas largely in part due to it's stunning finale which features the song, White Christmas, one of my all time favourite Christmas scenes in a movie (Holiday Inn also features the song White Christmas, just FYI). The tree, the costumes, the singing, the dancing... It's not necessarily a full on festive film but for that finale alone, it makes my list. Two singing and dancing sisters take up with two friends who have a male duo singing and dancing act, they travel to a Vermont Lodge and magic happens. It's a feel good, old school movie and anyone who doesn't get a warm heart when they sing White Christmas must have a heart of stone. Elf - a very new 'cult classic'. I don't think anyone anticipated Elf becoming the sheer phenomenon it has but I'm so very down with it. If you haven't seen it yet, I can't fathom why you wouldn't be watching it right now. Featuring Christmas songs, an Elf that's actually a grown man and a heartwarming 'Believe in Christmas' moment, this movie has cemented itself as one of my must-watch in the lead up to Christmas. It goes without saying that it's also one of the most quote worthy Christmas movies out there, ''The best way to spread Christmas cheer is for singing loud for all to hear''. It stars the comedy genius that is Will Ferrell and the lovely Zooey Deschanel who sings a beautiful version of Baby! It's Cold Outside in the film and if you don't feel moved when they start singing Santa Claus is Coming To Town we can't be friends. Jingle All The Way - it's one on paper that shouldn't work as well as it does. It stars Arnold Schwarzenegger as a Dad on a last minute present quest for his son and well, hilarity ensues. It's fun, it's funny and it has a great ending that's perfect for both parents and kids. Miracle on 34th Street - whether you're a fan of the original black and white version or the updated modern full colour version, this is a must watch at Christmas. A lawyer and a little girl team up to prove a lovely old man claiming to be Santa Claus is the real deal. Spoiler alert... HE IS! Home Alone - I recommend both 1 & 2 personally. You can watch 2 without watching 1. The difference between the two is that Kevin, the kid we all grew up loving, is left at home alone at Christmas in the first one and in the second he finds himself alone in New York at Christmas time. Both really great movies featuring a lot of Christmas aesthetics and of course, that version of Carol of The Bells, one of my absolute favourite festive carols. The Muppets Christmas Carol - this is one where I don't necessarily find myself putting the DVD on but if I catch it on TV I'm delighted and will settle down to enjoy it with my son. I have fond memories of watching it when I was smaller and it has become a tradition to watch it on TV in the run up to Christmas. We all know the story of Scrooge and with the addition of Kermit the Frog and some of our other most beloved muppets - this is just a really lovely retelling of one of the most important and treasured Christmas stories. Bad Santa - not really one for the kids, you've been warned! It stars Billy Bob Thornton as a drunk department store Santa who teams up with his hilarious side kick to rob said department store only to end up befriending a troubled kid and together they have the most untraditional lead up to Christmas but it works. For other fans of this one, you'll be happy to hear a sequel is on it's way! The Santa Clause - this one comes with a few sequels but the original will always be the best in my eyes. When a man (Tim Allen) ends up accidentally killing Santa at Christmas, he starts turning into Santa Clause himself. Beautiful soundtrack, lots of snow and Santa in a sleigh. It's got it all! Deck The Halls - this rates as one of my modern faves however my husband doesn't agree. It features what I can only describe as one of my most favourite moments in a Christmas movie - EVER! There's a moment when Kristin Chenoweth starts singing O Holy Night and it's just ever so slightly tear jerking in the right kind of way. The movie itself is about a guy (Danny DeVito) with great dreams of lighting up his house at Christmas so it can be seen from space, who happens to move in near to another guy (Matthew Broderick) and they get off on the wrong foot and then just keep getting off on the wrong foot. There are some really funny parts to this movie, you'll laugh and then you'll feel good - trust me! Christmas with The Kranks - Tim Allen gives good Christmas movie face. He's just a safe bet for that festive feeling. None more so than in this hilarious movie where, after thinking their grown daughter would be out of town for Christmas The Kranks book a cruise for the festive season, she rings to say she's actually coming home last minute and she's bringing a special guest! Cue a ridiculous scramble to get a Christmas party ready, which is hard to do when you've annoyed pretty much all of your neighbours which Tim Allen's character, Luther Krank, has managed to do. There's snow, feel good moments, relatable moments galore and it'll warm your heart while the fire warms your toes. Onto the second half, stay with me folks, it's about to get hella festive up in here! National Lampoons Christmas Vacation - this gets played, in full, on DVD, every year without fail. It's tradition. Chevy Chase and Beverly D'Angelo head a fantastic cast of actors who, regardless of how many times you've watched the movie, always draw a laugh and a warm festive feeling. It's a Christmas disaster movie in the funniest ways possible and there are so many laugh out loud moments it should be a staple in anyone's movie collection. How The Grinch Stole Christmas - I'm talking about the movie with Jim Carrey (who I'm admittedly not a huge fan of). Jim Carrey plays a good Grinch, that I will say! We all know the story of the Grinch who steals Christmas from the good folk of Whoville and it features another of my favourite Christmas Songs, Where Are You Christmas, tears... every time! Fred Claus - another modern Christmas movie that I didn't anticipate becoming such the firm favourite it has. Vince Vaughn plays a convincing bitter older brother to Paul Giamatti's Santa (Nick) Claus who is forced to move back home to the North Pole. It's funny and feel good and I love it! Santa Claus (The Movie, 1985) - This movie features my all time favourite movie dinner. Is that a weird thing to say? That scene where the little girl gives the boy a dinner and a can of coke... it's just always stuck in my head. This is one of the first Christmas movies I ever saw and it's a firm holiday staple. A woodcutter becomes Santa Claus who goes on to save Christmas from an evil toy manufacturer. David Huddleston plays a fantastic Santa in this one. A real old school style Santa Claus that's just really lovely to see around this time of year. Four Christmases - Vince Vaughn again who has surprisingly good festive acting chops, stars alongside Reece Witherspoon in this funny film about a couple who find themselves trying to visit 4 divorced parents for Christmas. Without giving too much away, it's a lighthearted movie that has a feel good ending. Brilliant for watching while decorating or chilling out sleepily. Arthur Christmas - we watched this last year and I know for a fact it'll be played again this year. I wasn't expecting this kiddie movie to be much good if I'm honest but within the first 10 minutes I was invested! It stars Santa's clumsy son Arthur who goes on a quest to get a present to a young girl in time for Christmas. Definitely one to watch with the kids but I bet you'll end up invested in the outcome as much as I was. Love Actually - this is hotly debated online as to whether it's a 'Christmas movie' or not but considering it features a lot of Christmas scenes and of course, the tear jerking Christmas airport scenes, it's one I find myself looking forward to every year. Not just for the ultimate Christmas song, Christmas is All Around. It's not often I find myself really enjoying british movies but this is one of the all time top 10 for me. Surviving Christmas - Ben Affleck in a Christmas movie? It shouldn't work but I rather like this one! Ben Affleck plays Drew Latham who finds himself alone at Christmas. Don't worry, he's a millionaire and he can afford to hire a family to spend Christmas with him - which is exactly what he does. Easy watching with some funny bits and a feel good factor. What else could you want when you're huddled under the blanket all cosy and in need of something festive and light? Meet Me in St. Louis - it's an oldie but a goodie. Not necessarily your straight festive flick but when Judy Garland starts singing Have Yourself A Merry Little Christmas, you'll feel Christmas in your heart... possibly in your eyes when they start leaking because mine do, every time. There are some great musical numbers in this movie making it a must watch in my opinion regardless of whether or not you can class it as a full on Christmas movie. It's worth the watch. And there we have it. 20 of my top Christmas movies that get traipsed out every year. In case you thought that was it, it's not... there are a few I was conflicted about adding in (either because they're not technically a Christmas movie or they're shorts or they're not an every year watch) but I've added these below because honestly, you can't have too much choice when it comes to a good Christmas movie! It's A Wonderful Life - watch if you need to remember the true meaning of Christmas and please do keep a box of tissues nearby... you will need them! The Nightmare Before Christmas - a good choice that you really can stick on anytime from just before Halloween really so watch it early on to ease you in. A Charlie Brown Christmas - Charlie Brown searches for the true meaning of Christmas and who doesn't love Charlie Brown? He tells it how it is in a way everyone can understand. The Snowman - the feel good movie short we all stop and watch when we see it scheduled for TV around Christmas. There's nothing like hearing the intro into We're Walking in the Air to give you those festive goosebumps. Holiday Inn - not to be confused with White Christmas! This one also feature Bing Crosby and the song White Christmas but is centered around an inn that only opens at the holidays. Watch it in black and white with a hot toddy. Bliss! The Holiday - I'll be honest, it's not a favourite in this house. It lacks a little something and personally I don't feel it was the right casting BUT if it's on I find I'll sit and half watch it. Watch it for the Surrey countryside in Winter, it's a cosy choice. 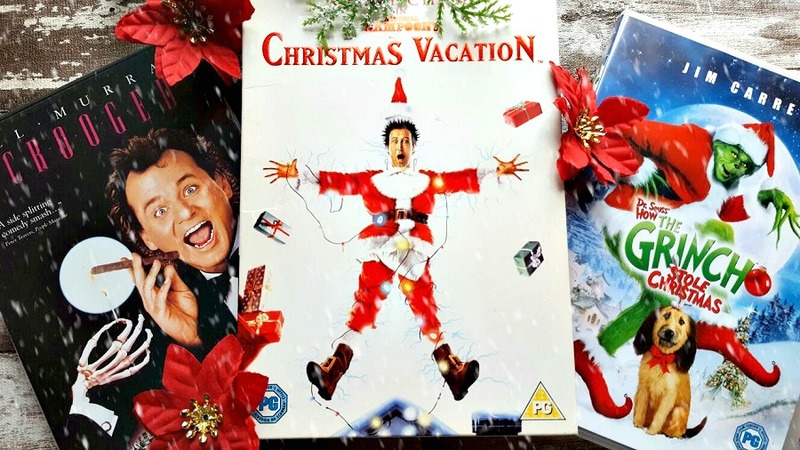 Christmas in Connecticut - it's never my first choice but I do love this movie, it's funny and one of the first 'Christmas disaster' style of movie we enjoy around this time of year. Perfect choice of viewing for a lazy Sunday afternoon. 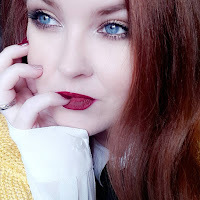 I'm sure there are some I've left out but this is my ultimate Christmas movie guide so go forth and feel ALL the festive!